Safed's music scene is rich and varied, and just as the city serves as an inspiration to many artists and Kabbalah scholars, many musicians are also unable to call any other place home. 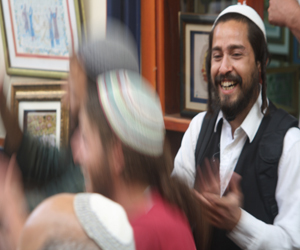 Each summer the city of Safed hosts a world-famous Klezmer festival. Klezmer musicians journey from around the globe to participate in the festivities, and every open space, concert hall, and gymnasium in the city becomes a possible venue for the many Klezmer performances that go on day and night. This is a festival not to be missed. Here in our Klezmer section, find out more about the Safed Klezmer festival and also enjoy our articles on the history and origins of Klezmer as well as informative pieces on the instruments used in Klezmer. In addition, check out some of our interviews with well-known Klezmer musicians. In this section we provide many one-on-one interviews with musicians and musical groups based in Safed as well as offer information on the many music venues in Safed where you can see your favorite musician perform. Also check out our articles on places to study music in Safed such as formal courses at the Safed College or more intimate courses in the privacy of teachers home.